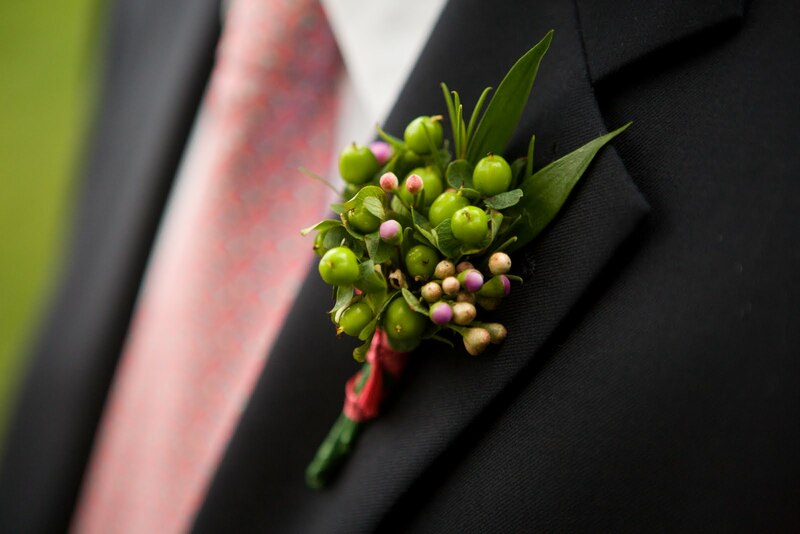 In the past, the flowers for the groom have been simple. Generally a rose, or a single flower of something that appears in the bride’s bouquet. 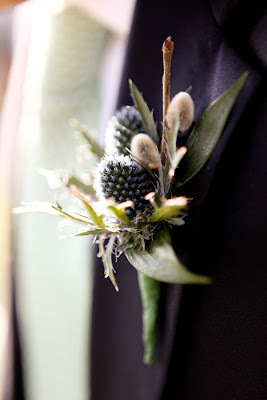 But lately, we’ve seen the approach to the boutonnière change, and our clients have been asking how to keep up with this new trend, and get the groom something more unique. 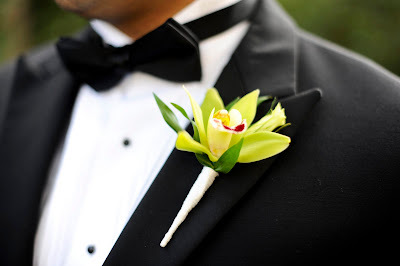 If your groom is going to be wearing a traditional suit, why not make the look more contemporary by changing the boutonniere from something simple to something colorful? The main colors that are going to be at the front of the alter are white from the brides gown, and black from the tuxes. By adding a splash of color, the groom will stand out from the crowd, and even from the groomsmen. By adding elements to the main flower of the boutonnière, we are able to create something special for the groom. Some of our most creative boutonnieres have had berries, extra greens, colors that correspond with the tie, even ribbons. Now is the time for groom style to become less cookie cutter, and more inspired. 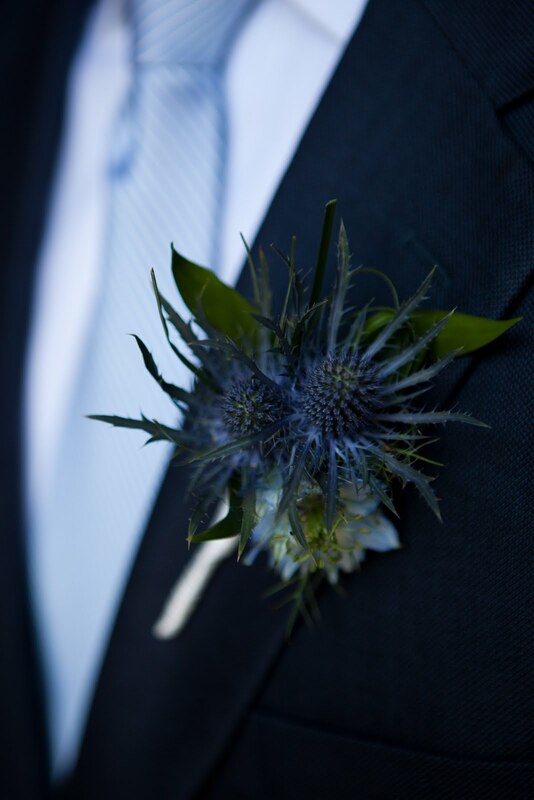 The coloring of the boutonnière does not always have to match the color scheme of the wedding. We recently had a good friend of the business get married, who’s bride wanted all of the flowers for the wedding to be bright pink. Our groom, for obvious reasons, did not like this idea for his boutonnière, so requested something a little more masculine. As a practical joke we made him a bright pink rose, with pink feathers and a matching ribbon to tie it all together. The look of relief on his face when we showed him his real flowers was priceless. It’s important to have the groom feel like their style and input is a part of the wedding, and not just an afterthought. By giving the groom something special, this day will be remembered as a unique occasion that was all about the bride and groom. Wow.. Beautiful Flower Decoration. Awesome Thanks..
Wow.. Beautiful Flower Decoration Ideas.. I am impressing Thanks.